In the 19th century, the Stevenson engineers pioneered marvellous lighthouses around the coasts of Scotland – lighthouses which inspire with their architectural elegance, and speak of compassion for sailors and fishermen risking their lives in these notoriously dangerous waters. But what was it actually like to be a Scottish lighthouse engineer, and how did the professional activities interact with social and economic conditions in Scotland at the time? How did the Northern Lighthouse Board’s Engineer (almost invariably a Stevenson) cope with weeks aboard a small lighthouse vessel, travelling around the rugged Scottish coastline on dangerous tours of inspection and interacting with local people in some of the remotest regions of Europe? The author reveals the fascinating story of the Stevensons as family members as well as engineers – brilliant yet fallible, tough yet vulnerable, with private lives that are little known, even to lighthouse enthusiasts. It sets their work in a historical and social context, drawing heavily on eye-witness accounts by two of Scotland’s most celebrated literary sons: Walter Scott, internationally famous poet and member of the Edinburgh establishment; and Robert Louis Stevenson, young family member and disenchanted engineering apprentice desperate to become an author. 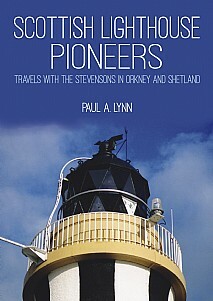 The reader is taken to the Orkney and Shetland Islands with descriptions of the chain of Stevenson lighthouses that illuminate a vital shipping route between the North Sea, Baltic, and North Atlantic. Finally we travel to Muckle Flugga, the northernmost outpost of the British Isles and last link in the chain, a vicious rock on which David and Thomas Stevenson dared to build their ‘impossible lighthouse’. This book will appeal to all lighthouse enthusiasts, lovers of the Scottish islands, anyone with an interest in maritime history and all those who enjoy a human story about the great 19th-century engineers who did so much to shape our modern world.